Getting married is like adopting a dog. At the beginning, it’s all puppy-love: every moment produces laughter and joy, and all the odd quirks are the cutest thing in the world. Every day you celebrate your love, and find new ways to enjoy it. But it’s also hard work. There’s toilet training, and going for walks, and making sure that you spend time with your marriage, even when you’re tired or stressed. Sometimes there are problems too: marriage isn’t trying to do the wrong thing, but it doesn’t know better yet, and you need to set boundaries and learn together. Those odd little quirks can become a nuisance. Those little surprises that marriage gives you aren’t always charming. Marriage can grow shaggy, and when marriage gets wet and smells and shakes all over you it can really test your patience. Over time, with routine and familiarity, marriage just isn’t the exciting puppy it once was. But as it matures, your love for it also deepens. Marriage can still be exciting and new, even after many years, but the very ordinariness of it is also part of the appeal: its place on the rug is stable and steady against all the challenges life can throw. Marriage is for comfort on cold nights, with its familiar weight and warmth in the darkness, and sloppy licks on the nose in the morning. Marriage is for sharing long days, for exploring new places, for fetching things that you throw away. Most of all, marriage is for tail-wagging slobbery joy. Marriage is your constant companion, and it needs to be loved and respected. But in return, marriage will be your best friend, and will love you forever and ever, even when its old and slow and forgetful. And hopefully one day, many years from now, you will be able to take marriage’s grey muzzle in your hands, and stare into its eyes, and know that you’ve shared something very special together. May you wend through waving buttongrass in the golden glow of fading light, as wombats rise to walk their trails in growing night. May you shelter then, seeing stars wink out between the waving arms of old gum trees, wary of their fickle limbs in the face of strong and growing breeze. May you hear the storm amid the peaks as lightning flares and thunder calls, listen to the howling wind and roar of hail ‘gainst thin tent walls. As the snagging claws of scrub ensnare and through strength wear, look to your side and take heart to see love standing there. For all these trials you share as one are stories of your life together, to tell with friends as tales of triumph when sitting calm in fairer weather. This definition of marriage was added to the Marriage Act in 2004, and has caused considerable discussion and intense emotions for many parts of the community. There is an ongoing conversation about what marriage is, who it is for, and what being married actually means. This is an important discussion, but one that can also be very exhausting. At times, the personal and the romantic meaning of marriage seems to be completely swallowed up by the political and the legal. So I would like to pause here for a moment to reflect on what marriage means, and what it means to us. Marriage has meant different things in different cultures over time, and there are still many problematic forms of marriage in the world. But at its most basic, marriage is an expression of commitment and love. Marriage is a bond of intention for two people to live their lives entwined with each other. It is a bond recognised across language barriers, across cultural barriers, across religious barriers and across all of human history. It is not just about being in a relationship with someone, but about committing oneself to that relationship and to that other person. It is not just about being in love, but about building love, and growing friendship and solidarity. Marriage has often been about strategic alliances and convenience, and this wedding is no different: I’m marrying Nick in an attempt to get a Tasmanian passport! But while marriage has always been about living a shared life with another person, one of the most meaningful cultural changes to marriage in the last few generations has been the emphasis on love. It is not just about two parts making a whole, or two lives bound together, but about choosing to do so. Although the debate about marriage in Australia is currently divisive, marriage is bigger, more meaningful and more reflective of our culture and values than any single definition, and we have no doubt that politics will eventually catch up. So as we get married today, we do so with the intention that our marriage is more than just the union of a man and a woman, but the union of two lives pledging love and commitment together. 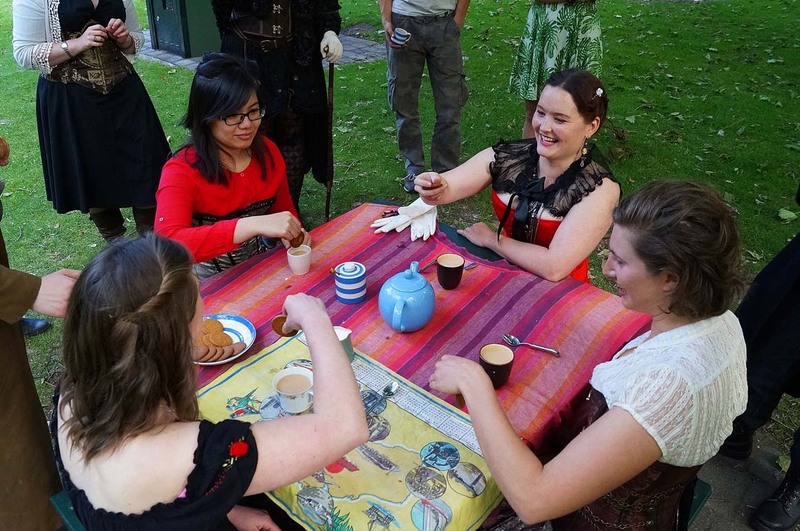 This post is to record the readings from the day, but is also an enormous thank you to everyone who made it so special – from my mother-in-law’s spectacular cooking, to the beautiful artistic contributions of our friends Annika and Jason – and a shout out to the local Taswegian businesses we used. For a more detailed, often funny and brilliantly written perspective of the weekend from one of the groomsmen, see Chris’ account. And there’s also my mother’s take on her first daughter’s marriage. This is not necessarily a criticism of the quality of the literature of course. 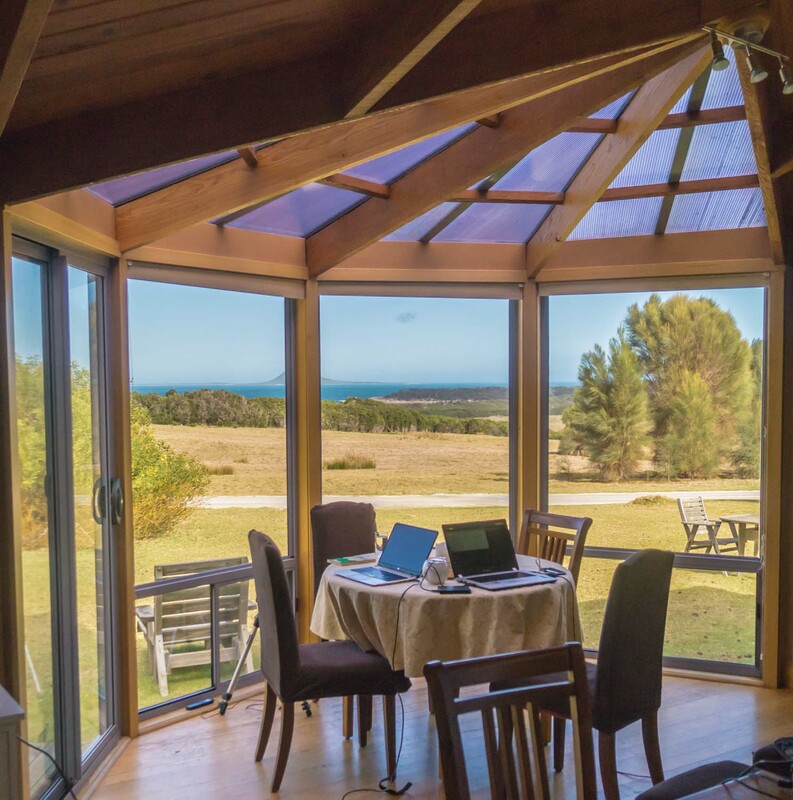 To imply this would imply that all travel writing is inferior, that all temporary residencies are creatively stunted, and that my own time on Flinders Island cannot produce anything of value! Actually, quite the reverse is true, since some of the best commentaries are written by visitors precisely because they are able to offer some perspective. Even so, the temporary nature of the authors of Flinders Island literature is, nevertheless, worthy of note. And with that introduction, I present to you a very local poet: Elvie Bowman. A collection of poems written by local poet Elvie Bowman. 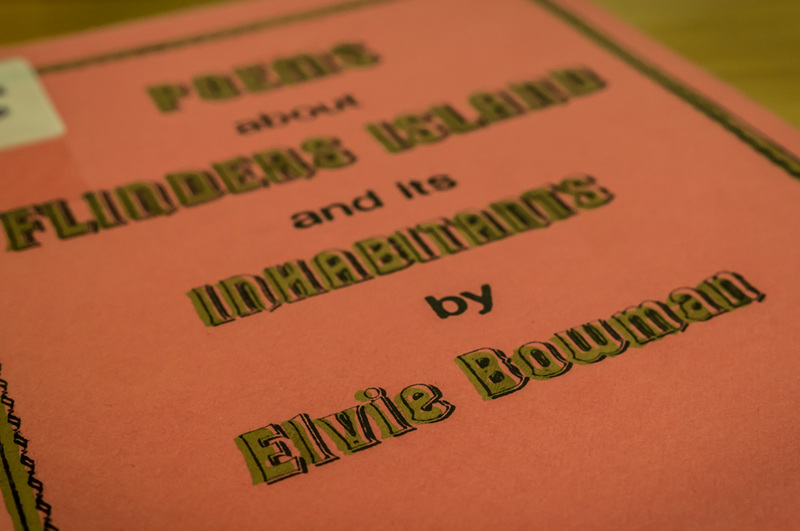 For many years Elvie’s poems have appeared in the “Island News” and have usually been written on topical subjects. They express her feelings and vast knowledge of the Island, the people, and the animals in it. Bowman’s poetry is well-known, and was invariably the first (sometimes only) answer I received to the question of what literature about Flinders Island is written by an islander. 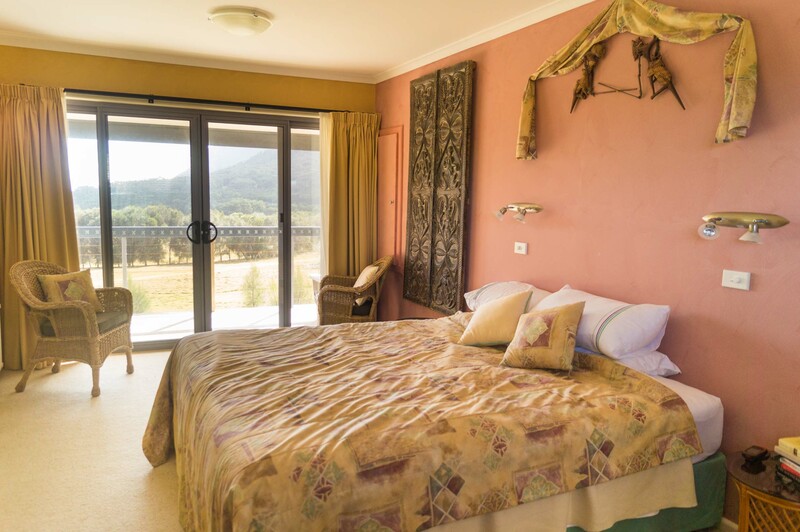 That marvellous blog Island Life Style; references Bowman’s most famous work, a sea shanty style poem written in the 1970s, “Where the Roaring Forties Blow” (in the booklet called simply “Flinders Island”). While I am not intending here to offer a full explication of the poems, I’d like to draw out a few points from Bowman’s work, to get an idea of what constitutes her unique voice. Most obviously, the poems follow a traditional form: stanzas with end rhymes, and a great many of Bowman’s poems are rhyming quatrains (abcb). This form suits the theme of the poetry, since Bowman in many ways offers an island form of pastoral poetry. Her verses describe the everyday rural life of the islanders, with some celebrations of the idyll. This form also has the advantage that it feels like poetry – it draws attention to its own recognisable and repeating patterns, and is very familiar for most Anglophone readers. This conservative form is then filled with an appropriately familiar use of language. The lines are from everyday life, and colloquial phrases give the poems a local character. In her poem “Pros and Cons”, Bowman says “Our cattle though are something” (4.1), and then later adds that the bull “doesn’t do things by halves” (5.4), the familiar idioms making for a very relaxed reading. The rhythm of the poems is also colloquial, often using “but” when desiring to clarify or expand on a statement, and there are a few rhetorical questions so open ended that punctuation marks aren’t even used (“Tell me, where does a dollar go” (7.4), “But what’s the use of grumbling” (12.1)). The language is inclusive, tending to be unambiguous even when using idioms, and very few poetic devices (similes, metaphors etc) are used. As such the poetry is quite self-contained, making very little reference to things beyond the island, and when these do occur they are comfortably familiar. In “Pros and Cons”, Bowman describes the island sheep through invocation of the nursery rhyme Baa Baa Black Sheep: “They all yield their three bags full” (2.3). This tendency to focus on the island extends to a suspicion of non-islanders. In “Michael Middleton Esquire”, the vet fondly remembered as an impostor when he was newly arrived on the island. A man, in neat attire. The poem describes the vet’s early mistakes, when he was accidentally taking the lives of dogs and cats, and thus proving right the islanders’ suspicion of the outsider. Even so, Mick finds his place on the island, improving his veterinary ability but also proving himself as a person to the community as a singer, musician and dancer. As he settles into island life, the Islanders in turn accept him, and the poem ends “Should someone ask “who is that Man”/They are told, that’s ‘Mick da Vet’”, transforming the derogatory title into an in-joke that Mick is a part of. This non-islander “other” is best demonstrated through the use of Bowman’s anonymous “they”, which turns up in several poems. In “Our Fading P.O. Tower”, the eponymous tower is being pulled down. “Now ‘they say’ it isn’t needed” the poet informs us, referring skeptically to this unknown authority that deems the tower no longer necessary. The poet, conversely, will miss the tower, and unlike the nameless authority she bestows human traits on others who will miss it, including golfers, boaters and birds. These descriptions of island life are evocative precisely because they are recognisable and local. The simple language becomes a vehicle for emotions and events because it does not draw attention to itself. In “The Drought 1987/88”, the line “The sheep so weak and cattle so thin/With calves at foot and no milk within” does not attempt to dress the animals with anthropomorphism, or to describe their suffering with emotive language. Instead, Bowman allows the events to be evaluated for what they are: hard facts of life. While some of Bowman’s rhymes and metres are a bit forced, she is nevertheless able to offer a poetical form of island life. The famous Flinders Island wave *can* be over-analysed, to amusing effect, but the wave is ultimately just a familiar and distinctive islander form of communication. In much the same way, Bowman’s poetry could be dressier, drawing on more intertextual references and poetic devices, but it would be less distinctively representative of the island. 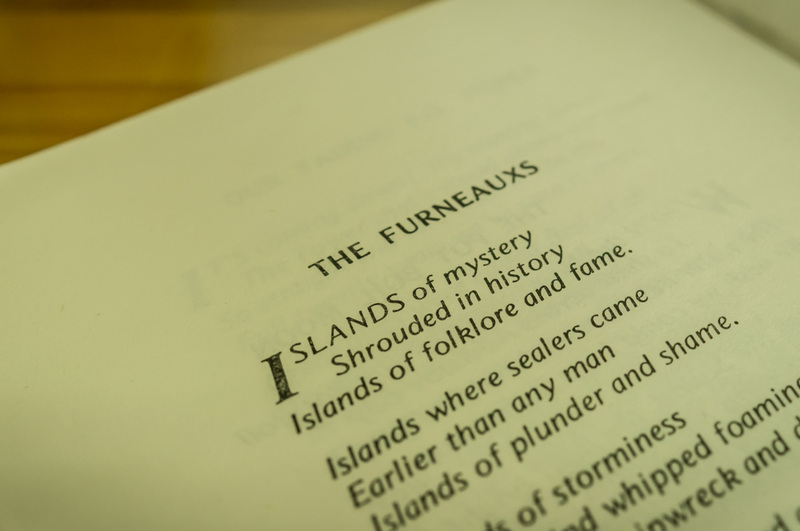 As such, Bowman’s poetry is a demonstration of a particularly local sense of the island, and a local expression of it. Other Island poets include Don Napier and Derek Smith. 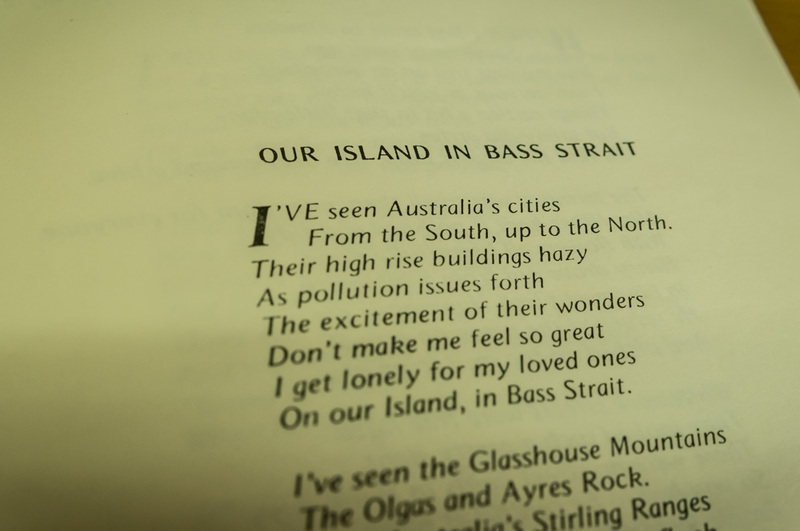 Derek Smith’s “The Song of the Furneaux Islands”, which also illustrates many of the same properties as Elvie Bowman’s work, appears in Jean Edgecomb’s book Flinders Island and Eastern Bass Strait. With peace for all who seek. Their harvest of the seas. As silently as a dream. In the clouds and the raging seas. Home to you and me. *Of the guide books available in Bowman’s General Store (Whitemark), which accounts – as far as I can tell – for basically all the guidebooks readily available, a good half is written by seasonal or occasional visitors. 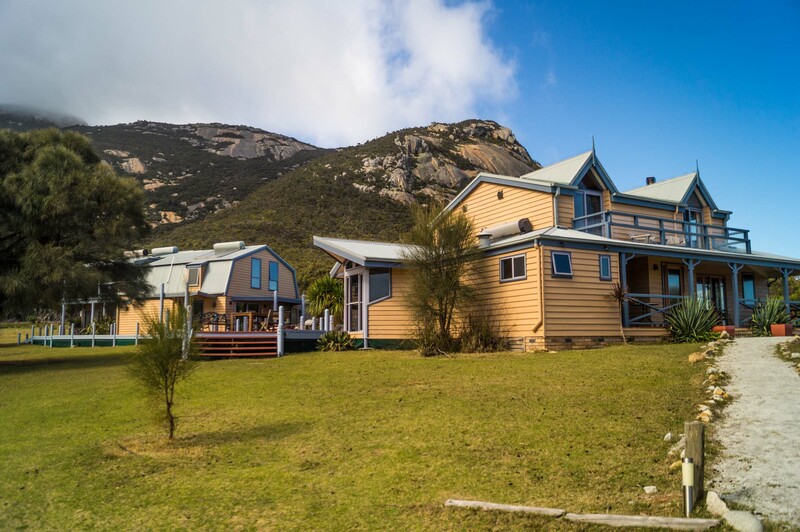 “A Walking Guide to Flinders Island and Cape Barren Island”, now in its third edition thanks to Dooreen H. Lovegrove and Steve Summers, is printed by the Flinders Council, and has always been a product of islanders. 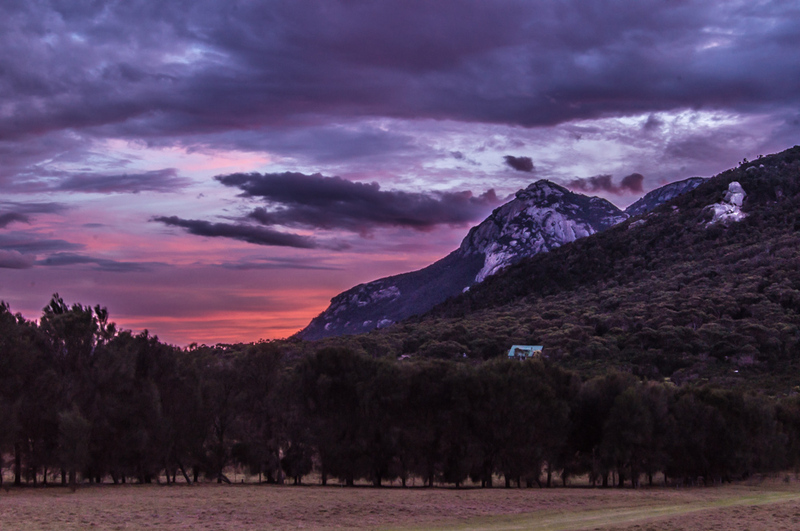 Ken Martin of “Walks of Flinders Island” draws on an extensive and personal knowledge of the island, having spent seasons on it bushwalking for the last 30 years, and indeed writing some of the earliest advice about walking in the area. 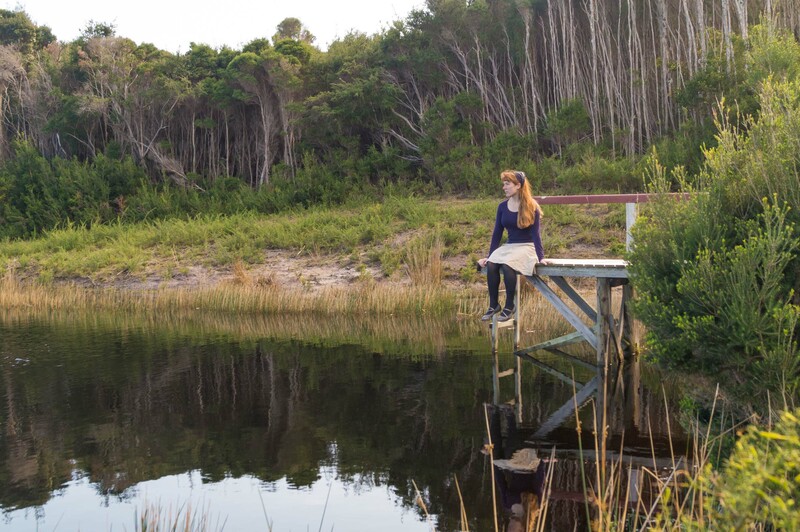 Jean Edgecombe’s “Discovering Flinders Island”, “Flinders Island: The Furneaux Group” and “Flinders Island and Eastern Bass Strait”, while written from Sydney, is based on Edgecomb’s many visits and draws on both expert and islander knowledge extensively. Len Zell, in Wild Discovery Guides, prefaces the book with the comment “My visits to the island were brief and I was able to talk to only a few people”, although the guide does not suffer for this and it should not be considered a criticism. Rather, I make this point to indicate that temporary authors are the bulk of the authors, not that their work is in any way inferior for this. When entering a new community, there is always the worry about reading the social expectations, and responding with the correct etiquette. On Flinders Island, the most pervasive and remarkable mannerism is the wave offered between the drivers of cars. Island Life Style has posted a highly amusing account of this published in the local Island News some years ago, but in short, there is a simple expectation that the drivers of vehicles will raise a finger or a whole hand in greeting when passing each other on the road. The result is both a remarkably welcoming and inclusive sentiment for those who are new to the island, and this terrible horror of implied rejection when a wave is not exchanged. Some years ago I came to the island for the Flinders Five Running Festival, and so being used to this special phenomenon, merrily wave to all those in view each time I’m in the car. My partner Nick, not having been to the island since he was a child, is less familiar with the wave habit, and so commits the social faux pas of IGNORING A WAVE whenever he sits behind the wheel, until – aghast and embarrassed – I attempt to correct his behaviour. The other waves of the island over the last week included the glorious waves of coloured light in the sky, the aurora australis. We had just enjoyed a delicious roast feast put on by botanical artist Jessie (and where I was remembered by one of the locals from the years when I visited the island as the person mad enough to enjoy swimming in the ocean in early September! ), and had headed to bed, when I saw an aurora alert online. We dashed outside again, and sure enough, the southern horizon was aglow. The camera was able to capture the colour better than the naked eye, although the descending clouds meant that we only had time for a few shots. Low cloud was also the undoing of our walk up Strzelecki, the highest mountain on the island. The summit seems to have a near permanent cap of cloud, even when the rest of the island is bathed in sunlight, but we optimistically thought that perhaps it would burn off by the time we reached the peak. The answer was a resounding negative, although we sat in the wind for some time staring into the white abyss waiting for it to clear. Many of the sunrise and sunset timelapses that Nick has been attempting to capture are clouded in, but the days have been kind, even if perpetually windy. Our trek out along Killiecrankie Bay was in fine conditions, although we soon discovered that finding one of the famous Killiecrankie Diamonds (actually a topaz) was more difficult than simply strolling along the beach and picking one up. Conversely, it was very easy to walk into the lovely little Whitemark library and pick up a beautifully illustrated book about the diamonds. And, of course, by driving into town we were awash with friendly waves. All photos and time lapses by the talented Nick.